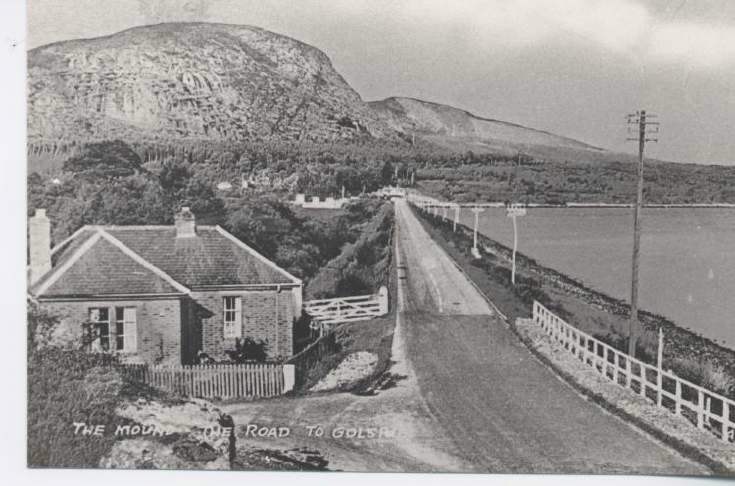 Black and white photocopy from postcard entitled "the Mound - the road to Golspie" of the mound road after removal of the railway and before upgrading. Telegraph lines shown on seaward side. This road I knew well in my youth when living and holidaying in Embo in the 1940s and 50s. If one turned left at the railway gatehouse shown in the foreground the road led uphill to Torboll Falls. There was a grassy area above the falls which was well sheltered from the weather by a high stone dyke. In this area we lit many a picnic fire using dry whin bush wood and cooked cockles and mussels which we collected from the Little Ferry area of Loch Fleet on our way from Embo. Of course we were also as children fed many stories how many a large salmon was poached from the fish ladder that bypassed the falls. I was never successful at this "sport" but there were many a story of how prize salmon were taken from the river at the end of a gaff. There were even stories that salmon were vain and if a mirror was placed on the river bed a passing salmon would stop on his river journey to preen himself allowing for him to be gaffed and readied for the pot. There were also stories that some youngsters were adept at ticking or guddling trout in the river. The modus operandi in this pastime was to wade silently in the river and feel gently under rocks for trout resting or hiding there. Once a trout was located in this fashion he was tickled gently until he stopped moving and went into a trance like state. A firm grip was then got on him and he was then thrown from the river on to the grass bank. In addition to the beauty of the place and the bonus of perhaps getting a fish or two there were also many hazelnut trees in the sheltered area adjacent to and below the falls. In the autumn it was fun to collect and eat the ripe hazelnuts from these trees. On a sadder note we also at times visited the tumbled stone remains of a number of cottages just uphill from the falls and to the left of the road. There were reports that these were what remained of the croft homesteads the owners of which had been chased from the land by the agents of a certain local nobleman. There were even reports that some of these “cleared” crofters were some of Embo’s original inhabitants.